A quiet oasis off of Istiklal Street, Saint Anthony of Padua Church is the largest Roman Catholic parish in Istanbul. The neo-Gothic church in Taksim is open to the public, and mass is conducted by Italian priests is a variety of languages. The original building was constructed in the 18th century, but the current building dates to 1912. 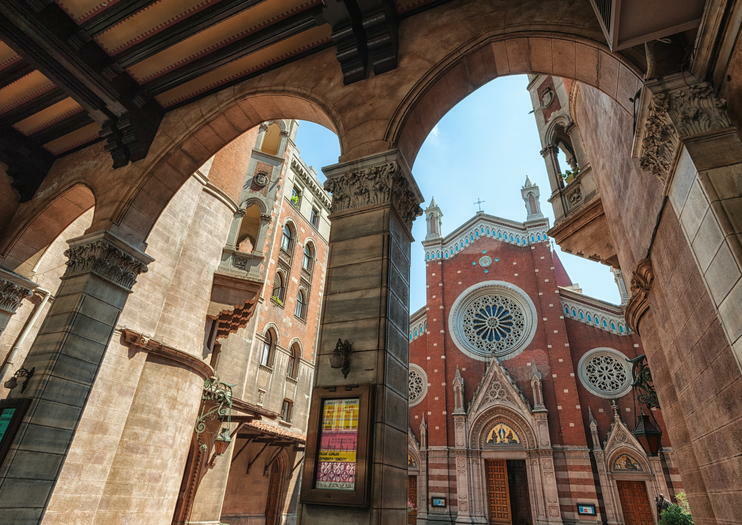 The neo-Gothic architectural style of St. Anthony of Padua Church, with its striking terra-cotta facade and intricate sunburst designs, is a distinct change from the mosques that are more common in Istanbul. The interior—which is open to the public—is columned and grand, and you'll find statues of Pope John XXIII, who was previously a delegate to Turkey, throughout. The church offers a quiet respite from bustling Istiklal Street. Private and small-group tours of the Taksim area stop at St. Anthony of Padua Church. Tours often also visit Istiklal Street, Taksim Square, and the many cultural and religious sites in the area. Dress respectfully and turn off your phone when you enter the church. St. Anthony of Padua Church is a must-visit for history and architecture buffs. The church is an active place of worship, and the building may close to the public during mass. St. Anthony of Padua Church is located on Istiklal Street, a pedestrian boulevard. The historic tram that runs the length of Istiklal Street connects the church to Taksim Square and Tunel Square, at either end of Istiklal Street—both major transportation hubs. Each square is also connected to the main tram line by funiculars. It’s possible to reach Taksim and Tunel by metro. Taxis are abundant in Taksim Square. St. Anthony of Padua Church is open to the public most days from morning to evening. During mass on Saturday nights and Sundays, only part of the church is open to visitors. Opening hours can change depending on religious holidays, so make sure to check ahead of time. St. Anthony of Padua Church is known for getting into the Christmas spirit. Expect a Christmas tree outside the church, covered in sparkling lights and seasonal decorations. Look for a large-scale nativity scene that depicts the birth of Jesus, as well. If you time it right, the church may be filled with worshippers singing carols. Sample your way through Istanbul on this small-group food and culture tour. Stroll the city’s historic streets with an expert guide, dipping into local markets and cafes along the way. Taste foods from typical streets vendors and patisseries (own expense), and peruse some local shops as well. This tour offers a great overview of Istanbul’s lively food scene. Group size is limited to 15 people to ensure a quality experience.